The rays of infrared heating directly heat the object, person, animal or machine affected by the rays instead of the surrounding. This makes infrared heating particularly suitable for use outside or in large, unheated spaces. You will not experience any air movement, unpleasant light or flue gases. The Heatray is particularly suitable for use in the workplace, in both large and small spaces such as factories and markets but also for painters and so on. 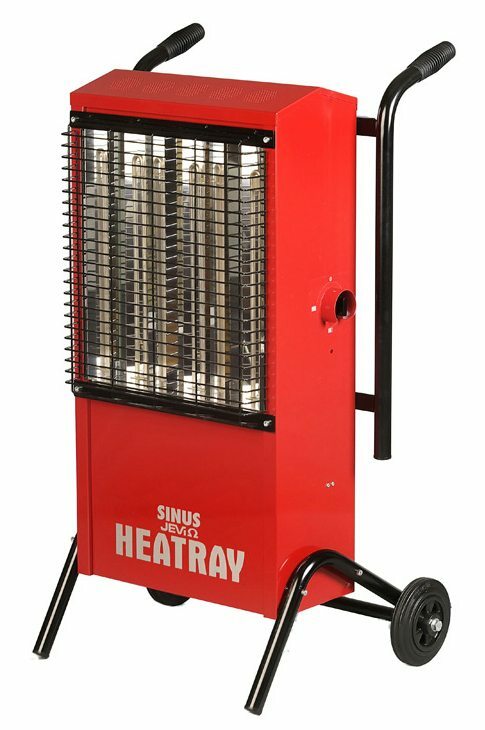 The Sinus Jevi Heatray is a mobile radiant heater with shock proof elements of stainless steel. The casing of the Heatray has a red epoxy-coating. The total power is 3 kW but can be switched in 3 steps (1000, 2000 and 3000 Watt). The Heatray is supplied with a black bracket and 5 meter cable.